When it comes to identifying ducks, I am woefully inept. For that matter, most water birds are mysteries to me, though there are a few exceptions. Like Mallards. And American Coots, which were one of my mother’s favorite birds. 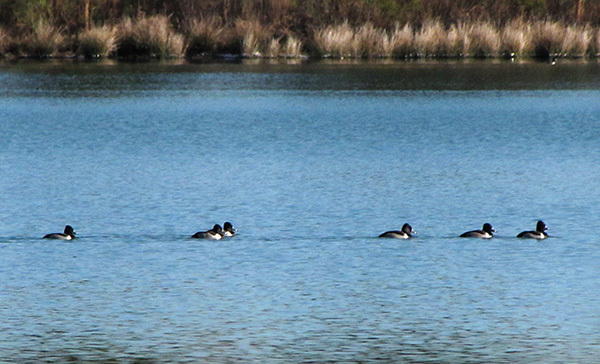 I confess this flock confused me at first, because I am not accustomed to seeing American Coots in such numbers. I usually find single individuals scattered among flocks of geese or gulls, rather than an entire flock all on their own. I was bemused by their tight formation. Were they alarmed by something beneath the surface of the water? Were they trying to stay warm? 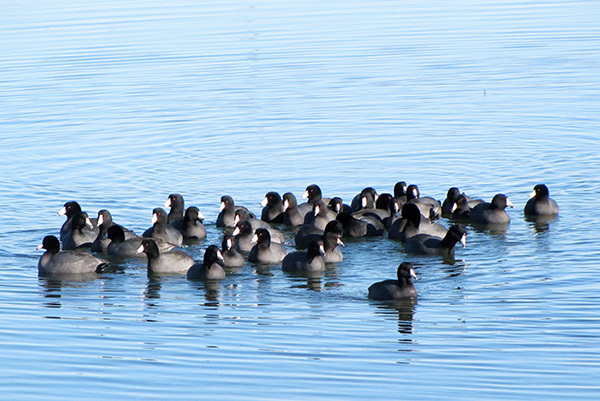 Or is this normal behavior, when American Coots gather into flocks? In order to identify a water bird that isn’t a Mallard or an American Coot, I need several clear photos and a prolonged session browsing Cornell Lab of Ornithology’s All About Birds website. That’s how I learned two new ducks on Wednesday. Ring-necked Ducks have distinctive rings around their bills, much more easily seen than the faint, reddish rings around their necks. 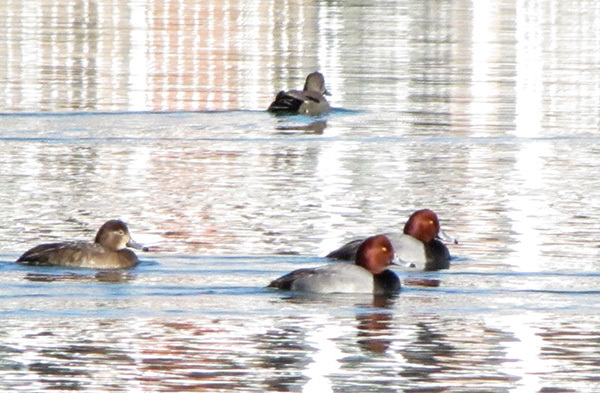 And Redheads are not the only ducks with red heads, but it seems they are the only red-headed ducks with gray backs and black-tipped blue bills. Two new ducks should add up to a fulfilling walk with my camera, but, inevitably, each discovery is accompanied by elusive riddles. For every bird that strays within my camera’s reach, many others stay too far away to capture in enough detail for identification. For example, I’m reasonably certain this is a loon, but which species of loon? 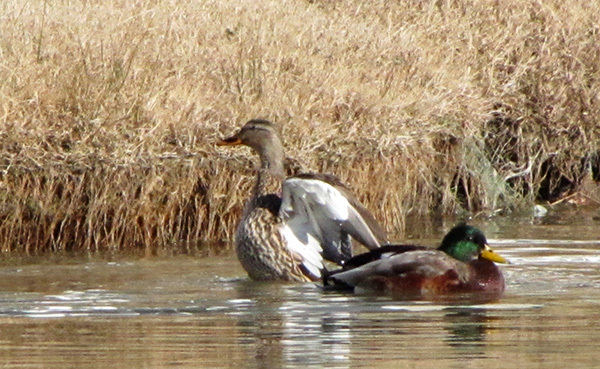 And a rather nondescript pair of ducks teased me with glimpses of white wing patches. That might suggest Gadwalls, but what about the hint of a collar? These photos simply aren’t clear enough. Another entry for the “Unknown Ducks” folder in the archive. Sometimes the photos are clear enough for identification, but only just so. Wednesday’s walk added a new pair of Belted Kingfisher images to the archive, but one photo is out of focus and the other is underexposed. Gadwall are the only dabbling ducks with a white wing patch. I think that this is what you have in your photos. Other things to look for are bill colour and head shape….but the white wing patch is a dead giveaway. Your loon looks like a Common Loon. Note the hint of the collar bending around the front of the neck. They also have a much heavier bill than Red-throated Loon, which appears almost dainty. I’ve never seen a Pacific Loon, and though it it out of range they do show up on the Great Lakes from time to time. Nice to see so many different waterbirds in your post….everything here is frozen solid, so there aren’t many here. Thanks for the feedback. I was hoping you would stop by and help out with the loon! I’ve been taking a lot of walks near water because so many ducks visit here in the winter, but I can’t identify most of the birds that I see unless I get decent photos for later study. I need to get a good field guide to carry with me, so I won’t have to depend so much on my camera. Interestingly, a Pacific Loon spent some time in our area last spring. It was spotted on a lake adjacent to where these photos were taken.